So I decided to make some pickup rings for the 8 string Humbuckers before they left the shop. They look great. These pickups ended up being a modified version of my Obsession / Bolero set. The coils are wound to Obsession Bolero specs but we used Neodymium magnets for an better top and and more clarity. This set of pickups has turned out to be rather significant as they will be the last "super customs" to leave the Searcy String Works shop. We really didn't start out trying to build they most insane pickups in the world. It just sort of happened. Alicia and I really do 4 things here at SSW. First, we build our own line of pickups. Second, we build OEM pickups for several luthiers. Third, we do pickup restorations and finally we do the Super Customs pickups. This last category has gotten us the most recognition but it has also been the most difficultly to do. When word got out that we were willing to build just about anything... well.... folks started taking us up on it. It's been a fun and sometimes wild ride bringing everyone's dreams to life. There have been some great discoveries and some major failures. All of which has led to a much better understanding of what works and what really dosnt' The biggest drawback to all this custom work has been that I have to keep a massive number of different parts on hand so that I can be ready for they next crazy idea. 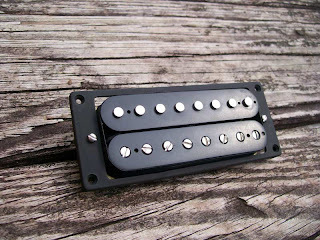 For example I stock 16 different types of PAF style humbucker bobbins and almost 50 different sizes and shapes of Neodymium magnets. Then there is the issue of time. Most of the custom designs I get are for extended range instruments or just plane wacky things like the Altoids pickups. These orders rarely can be built with off the shelf parts. At the very least I will have to modify bobbins and base plates and covers and magnets. All of this takes up lots of time. So like I said, it's been lots of fun building the Super Customs but the times, they are a changin'. With the massive tax increases being pushed in the U.S. against businesses big and small we have to start tightening the belt around here and the most obvious way for us to do that is to cut the Super Customs. It's time to go back to our roots and focus on the original designs that put us on the map to begin with. As we get the new models ready to roll we will be writing about them here.